Renowned as one of the friendliest of football clubs in Guildford, Weysiders Football Club was formed in 1973 by a bunch of boys at the Royal Grammar School in Guildford, led by Tim Davison, Richard Denness, Tim Burgess and Tony Day. 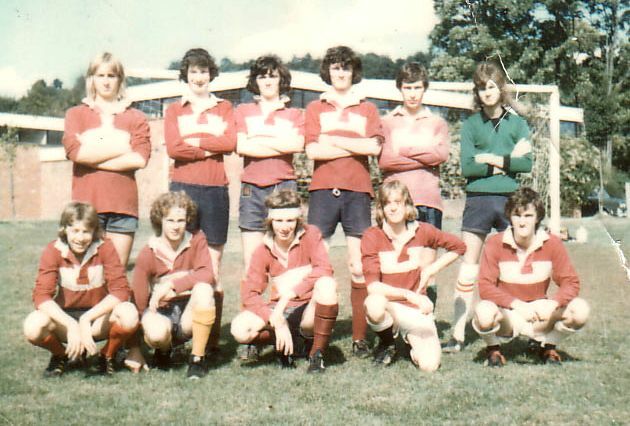 The Club joined the Guildford & District League in 1974. The team didn't have great success in the early years, but did achieve promotions as the league was reorganised and reached the top division in 1978-9. Key men behind the club at this time were Kevin Simmons, Dave Lovegrove and Malcolm Denham. Tim Buzaglo joined the club in 1979 and made a quick impression with his gloascoring exploits. As more players joined the club, a Sunday team was formed to keep more players happy, the team joining the Surrey & Hants Border League in Division 5 in 1981-2. That was also the season that Garry Pierrepont took over as manager, and with the likes of Buzaglo, Graeme Chrystal, Tony Davies, Ian McIsaac, Andy Horner, Derek Over, the club entered a period of great success, winning the Guildford League and Cup and Border League Division 5. Promotion to the Surrey Intermediate League was also achieved. Season 1983-4 saw the club hit its peak, winning the Surrey Intermediate League Division 2 and League Cup, and the Border League Division 3, the Intermediate League Cup and the Sunday County Cup (Junior Section). Perhaps an even greater achievement was winning the Surrey Intermediate League top division a year later, and the Border League Division 2 was also bagged. A Reserve team as formed which won its Intermediate Division straight away. Yet the success could not be sustained and when the Intermediate League was not retained in 1985-6, the Club changed. It merged with Guildford City Social Club to become Guildford City Weysiders FC. The Sunday team was disbanded in 1987. Tim Buzaglo left the Club to join Woking and achieve FA Cup fame. Garry Pierrepont stepped down as manager. The Reserve team commendably won the Surrey Intermediate League Reserves Invitation Cup in 1991, and were twice runners-up in the Reserves League Cup (1990 and 1993), but success eluded the club over the next few years. After some relegations and promotions due to league rearrangements the FIrst Team won the Surrey Intermediate League Division 3 in 1997, the same season a third (or 'A') team was formed. That team won the Guildford and Woking Alliance Division 2 in 1999. Since then a fourth team was formed in 2001 and ran for eight years; the 'A' team was disbanded in 2011 as the Club fell into difficult times. Paul Martin almost single-handedly carried the Club through the next season, now with two teams in the Guildford & Woking Alliance. In 2013, with no remaining connection with Guildford City Social Club, Weysiders reverted back to its original name. Back row (l to r):Colin Sharp, Garry Pierrepont, Andy Davison, Tim Davison, Malcolm Denham, Richard Denness. Front row (l to r): Mark Pasco, Keith Ford, Kevin Simmons, Keith Meynall, Andy Vernoum. 20th September 1975: Weysiders 3, Hambledon Reserves 2, Guildford & District League Division 4.